The main aim and objective of the organisation,Public Health Engineer Organisation (PHEO), is the Inspection & Monitoring of Water Supply & Sewerage System of all Urban Local Bodies and Census towns of Odisha. 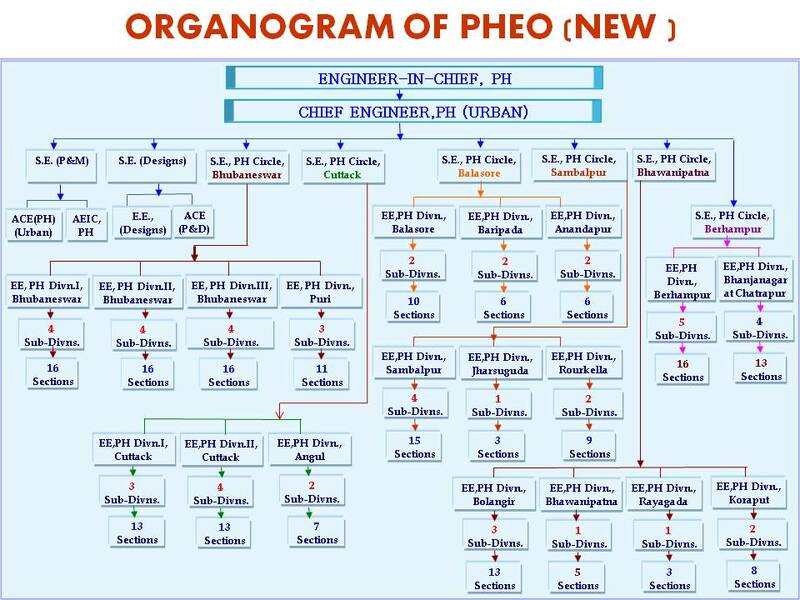 ​The PHEO under the administrative control of H&UD Deptt. is responsible for providing safe drinking water to all the ULBs across the state. PHEO has so far executed many water supply project starting 1956 in all ULBs of Odisha. The main function of the P.H.E.O is to plan, implement & maintain Urban Water Supply Schemes. The P.H.E.O under takes filed investigation, survey, data collection, preparation, execution & maintenance of W/S Schemes. It also takes care of operation & maintenance of sewerage system. PHEO executes & maintains all water supply infrastructures in different ULBs as per the provisions envisaged in the annual budget. Public Health Engineering Works under State Plan, CSP, Drought, Flood, RLTAP, JnNURM, UIDSSMT are executed by PHEO. It provides technical guidance on engineering works executed by the NACs/ Municipalities/ Municipal Corporations of the state. It also collects Water & Sewerage Charges (User Charges) from consumers. To provide potable drinking water supply to the people of all the Urban Local Bodies of Odisha. Initially, Public Health Engineering Organisation was looking after both Water Supply to Rural as well as Urban areas under the administrative control of Housing & Urban Development Department. After transfer of Rural Water Supply Schemes to the control of the Chief Engineer, RWS&S under the administrative control of Rural Development Department, the Urban Wing is functioning under the Engineer-in-Chief, PH ,Odisha in the 1st Floor of Heads of Department Building under administrative control of Housing & Urban Development Department. Chief Engineer, PH (Urban) looks after all developmental and maintenance works of water supply to all Urban Local Bodies. All works are funded by State Government as well as Central Government. The Chief Engineer, PH (Urban) exercises has power as per relevant code to manage the system both technically & administratively. a) Administrative Control of all technical and non-technical officers. b) Monitoring the timely & successfully completion of water supply work in the State of Odisha. c) Monitoring for successfully maintenance of water supply to the Urban Local Bodies. The suggestion of local representative and the General Public are duly honoured by this Organisation & problem sorted out within the available resources at the disposal of Department. Grievance if any may be addressed to the Chief Engineer during office hours on any working day for its redressed. Besides Grievance Cell is conducted in each working Saturday at 11.00 AM to 12.00 Noon by Chief Engineer, PH along with a team of officers and staff to disposes of the grievance petitions. Engineer-in-Chief, PH, 1st Floor, Heads of the Department Building, Unit-V, Bhubaneswar-751001. PH Circle, Bhubaneswar, Backside of Rajeev Bhawan, Unit-V, Bhubaneswar-751001. PH Circle, Sambalpur, Brooks Hill, Sambalpur. PH Circle, Berhampur, Near RDC Office, Kamapalli Chhak. PH Division-I, Bhubaneswar, Backside of Rajeev Bhawan, Unit-V.
PH Division-II, Bhubaneswar, Po.- Bhoinagar, District- Khurda. PH Division, Puri, Water Works Road, Near Rama Mandir, Puri. PH Division-I, Cuttack, Chhatrabazar, Cuttack. PH Division, Baripada, Near Chhaupadia. PH Division, Sambalpur, Brooks Hill, Near Stadium. PH Division, Bolangir, Tulsi Nagar, Infront of Aurvedic College, Bolangir. PH Division, Berhampur, Near RDC Office, Kamapalli Chhak. PH Division, Chhatrapur, LIC Colony Chhak. PH Division, Koraput, Backside of SBI.